Your digestive tract contains living bacteria that are important in metabolic functions that support digestion, the digestive system and produce essential nutrients for your body. Keeping these bacteria in balance is essential to good health. Yogurt that contains probiotics helps your digestive system function properly. Probiotic yogurts are fermented dairy products that contain beneficial bacteria. Not all yogurts are considered probiotic, so check the label for the statement "live active cultures." 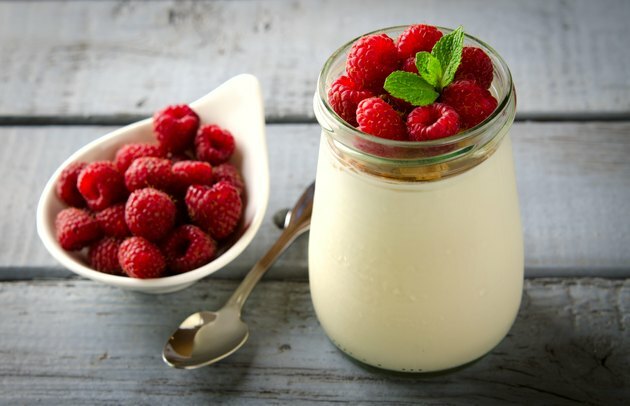 Probiotic yogurts can contain a variety of live active bacteria cultures that aid in digestion. Lactobacillus acidophilus is one bacterium that aids digestion in the small intestine. Lactobacillus acidophilus also produces vitamin K, which is a fat-soluble vitamin that helps your blood clot, or coagulate. It has also been found to improve lactose digestion and reduce lactose intolerance symptoms. Another beneficial bacteria in probiotic yogurt is bifidobacterium lactis, which improves digestive comfort. Bifidobacterium lactis helps your digestion and has been shown to reduce symptoms of irritable bowel syndrome, or IBS, according to a study headed by D. Guyonnet, published in the 2009 issue of the "Journal of Digestive Disease." Bifidobacterium lactis also helps to prevent constipation and irregularity. Adding probiotic yogurt with a variety of live active cultures to your diet will aid digestion and may help prevent chronic intestinal disease. Streptococcus thermopohilus is another beneficial bacteria in probiotic yogurt. Streptococcus thermopohilus bacteria fight lactic acid bacterium that can impede proper digestion of your food. Streptococcus thermophilus soothes the stomach, which helps to reduce upset stomach and lactose intolerance. The beneficial effects in the digestive tract include improved lactose digestion, and reduce abdominal pain, diarrhea and flatulence from indigestion. Lactobacillus acidophilus, bifidobactium lactis and streptococcus thermophilus are the more common bacteria found in yogurt, but there are other strains of beneficial bacteria such as l. casei and l. rhamnosus that are also found in probiotic yogurts. In addition, the National Yogurt Association, or NYA, has established standards for the quantity of live and active cultures. Yogurt manufacturer's products must contain at least 100 million cultures per gram at the time of manufacture; frozen yogurts must contain 10 million cultures per gram at the time manufacture. If the yogurt product contains these minimums, then the NYA Live and Active Cultures seal will be present on the label.